To watch the ethereal and elusive Northern Lights is to witness one of nature’s most splendorous sights: a celestial dance across the Arctic sky that surely features near the top of most – if not all – travellers’ bucket lists. Those seeking this remarkable phenomenon have a decent pick of destinations, from the remote expanses of Lapland to the upper reaches of Canada. Stunning hotels abound in these frigid and oft-remote locations, but all nonetheless offer a variety of unforgettable experiences. Here, we’ve rounded up the best hotels across the Arctic Circle for watching the aurora borealis. Guests can snuggle up for the night with the Northern Lights dancing above them at this igloo village in Finnish Lapland. The igloos are made of glass, and have been designed so that windows don’t frost over or steam up. Each has a comfy bed and en suite bathroom, providing a cosy viewing area from which to observe the stars or, conditions permitting, the aurora. During the coldest part of the season, the accommodation range extends to traditional snow igloos, providing the option of a more authentic Lapland experience. Hotel Kakslauttanen in Finnish Lapland offers a number of glass igloos from where guests to watch the Northern Lights in warmth and comfort. The resort has 32 individual Arctic TreeHouse suites housed in cleverly designed wooden shingle-tiled cube units, with one side comprised of a panoramic window, and five Arctic Glass Houses. The units rest on short stilts and overlook a shallow valley, with a clear view of the aurora borealis, when the sky is clear and the Northern Lights are ‘performing’. They ensure privacy, and some are adjoining so small groups and families can lodge together. The stilted suites at Arctic TreeHouse hotel all have large, panoramic windows, the better to watch celestial displays. This Lapland hotel also offers glass igloos from which to survey the Arctic skies in comfort, as well as the part-subterranean Northern Lights House, complete with large windows from to watch the lights play out. Guests can also choose to do this from the house’s private terrace, where a hot tub provides welcome respite from the cold winter evenings. There’s also a communal teepee with a fire for aurora-hunters to gather and swap stories after a night out in open country. Guests at Levin Iglut can choose between a range of glass igloos and the well-appointed Northern Lights House, complete with hot tub. Bed down in a bubble at this rural retreat near Lake Inari. These heated pods, or ‘Aurora Bubbles’, contain a double bed and a loo, and offer a private vantage from which to scan the skies. For those who want to get out and about, the hotel runs a wide variety of light-hunting expeditions, including sledding, snowmobiling, snowshoeing, camping or, more sedately, by car. 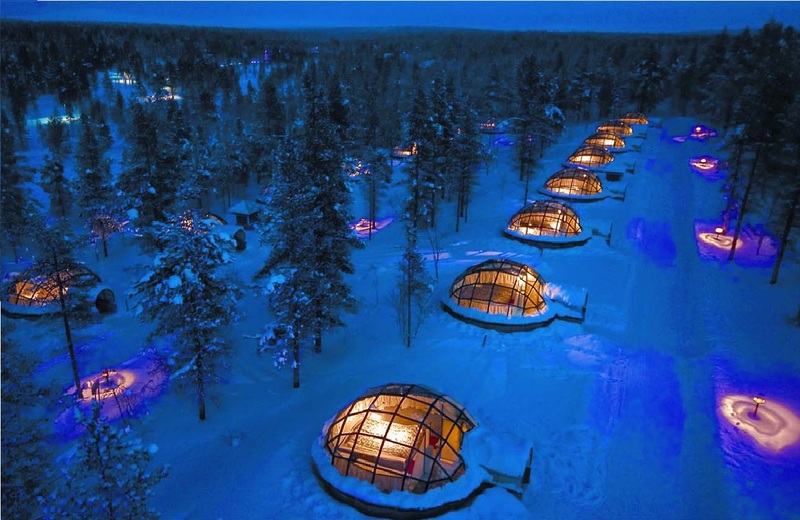 Nellim Wilderness Hotel offers heated ‘bubble’ pods for a comfortable night of aurora-watching. Set against a backdrop of mountainous lava fields, which are visible through three large glass walls, the panoramic view from the hotel’s bar makes a cosy spot from which to view the elusive Northern Lights, a glass of Icelandic schnapps in hand. Other natural wonders in the vicinity include the Pingvellir National Park, Thingvallavatn (Iceland’s largest lake) and the hot springs at Geysir. Hidden amidst the deep valleys of northern Iceland, Deplar Farm’s remoteness is all the better for the views of the aurora as it streaks across the sky, untainted by even the faintest amount of light pollution. Its position is also a draw for sporting enthusiasts, who head here to take advantage of the heli-skiing in the winter months, with kayaking, mountain biking, salmon fishing and hiking providing summer alternatives. Deplar Farm is a grass-roofed adventure destination surrounded by towering snow-dusted mountains and emerald green pastures. Built in log-cabin style, the traditional design of this countryside hotel (two hours from Reykjavik) offers cosy and intimate interiors. Guests are met in reception by the sight of a polar bear statue towering more than 10ft-high, setting the tone for the rest of the hotel. Upstairs, a balcony wraps around the hotel’s bar, at night providing a backdrop of twinkling stars and, if you’re lucky, the green shimmer of the Northern Lights. Hotel Rangá has been built in the style of a traditional Icelandic log cabin. Constructed annually, The Icehotel offers the ultimate in cool accommodation. The temperature inside hovers between -5C and -8C so guests nap wrapped in thermal sleeping bags atop beds of reindeer skins. There are more traditional rooms and chalets for the less adventurous. The hotel offers overnight excursions in search of the Northern Lights, which can be a very localised phenomenon, and guests can choose between a snowmobile or their very own howling dog sled team. The remarkable Icehotel is rebuilt each year Jukkasjärvi, with an ever-changing range of suites designed by the world’s top ice sculptors. The Bird’s Nest? The UFO? The Dragonfly? The choice of accommodation is tree-mendous at this Harads hotel. Located in a pine forest, there are far-reaching views across the Lule River and the lack of light pollution makes this a perfect spot for observing celestial displays. The hotel even runs Northern Lights photography excursions, alongside moose safaris, ice fishing and dog sledding. A UFO, a bird’s nest, a mirrored cube: the types of accommodation available at Treehotel are as varied as they are eccentric. Guests can be forgiven for being particularly hopeful of a sighting when staying at this appropriately named hotel in Grindavik. Its 42 spacious rooms are simple in style, but feature large windows through beyond which guests can often sight the aurora shimmering overhead. Another big plus is that the renowned Blue Lagoon, a geothermal spa of strikingly vivid hue that ranks among Iceland’s most popular attractions, is within walking distance of the hotel. The Lagoon remains open until 9pm in the winter months. Perhaps unsurprisingly, Iceland’s Northern Light Inn is a top spot for watching the aurora borealis. This igloo hotel is constructed annually on the banks of the Alta River, in the middle of the Finnmark Plateau in Norway, from where it stakes a strong claim to being the northernmost ice hotel in the world. Aside from the ice-cool accommodation, the hotel offers overnight stays in a traditional lavvo tent. Fires are lit both inside and out so guests can comfortably await the arrival of the spectacular light show. At the Sorrisniva hotel in Norway, the best Northern Lights moments can be had while staying in a traditional lavvo tent. These traditional Rorbu cabins off Lofoten are ideally-suited for those hoping to experience the Northern Lights, but with the added diversions of urban culture on the doorstep (albeit the rather limited offerings of Svolvær). Views from the waterfront accommodations, which sleep up to eight people, encompass mountains, sea and, with luck, the lights dancing above them. The hotel organises lectures and evening barbecues on the beach for those wanting to learn more about the phenomenon. Svinøya Rorbuer in the Lofoten Islands combines incredible lights displays with equally astounding mountain and sea views. Kirkenes Snowhotel, set in the remote Finnmark region of northern Norway, is well-placed for spotting the aurora, and also offers overnight bus tours in pursuit of the often elusive lights. The hotel is divided into two parts: an ice hotel, bedecked with ice sculptures, and a hillside of traditional Sami cabins that appear to define the word hygge. There are also husky trips and ice fishing on offer. The traditional Sami cabins of Kirkenes Snowhotel seem to define the word ‘hygge’. This remote hotel in Canada’s northern wilderness is by no means easy to get to. No roads lead there, so your only option is the hotel’s own float plane, which departs Yellowknife each Wednesday, Friday and Sunday. It’s worth the trip though – not least for the utter lack of light pollution that gives the aurora displays a vivid intensity, as the Duke of Duchess of Cambridge discovered when they visited in 2011. Blachford Lodge is so remote that it can only be reached by float plane. As such, light pollution is minimal, making aurora displays all the clearer. This Fairbanks hotel offers nightly snow coach tours in search of the Northern Lights. Departing at 10pm, guests travel to a height of 2,600ft – the higher the better when it comes to viewing this elusive phenomena – where a heated yurt awaits. Accommodation is provided in the form of cosy wooden cabins, while warmth is always attainable via the natural hot springs for which the resort is named. Chena Hot Springs Resort in Alaska provides snow coach tours to guests who wish to go hunting the Northern Lights.